851974 BIONICLE Stationery Set is a BIONICLE set released in 2007. It featured a writing pad, pencil, ruler, and an eraser. 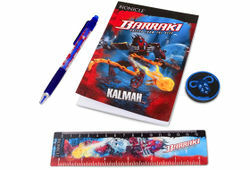 Facts about "851974 BIONICLE Stationery Set"